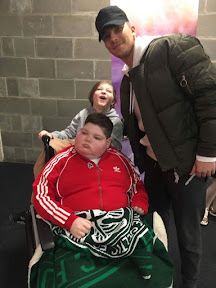 X Factor's Honey G gave some high fives and big hugs to terminally ill 12 year old Mark 'Sparky' Gallagher before taking to the stage for the X Factor tour in Glasgow. 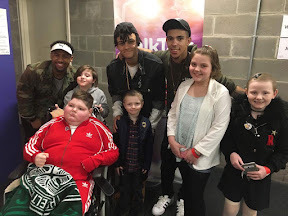 The rapper joined winner Matt Terry, Scots contestants Emily Middlemas and Ryan Lawrie and other finalists to meet up with a party of kids from the Les Hoey MBE Dreammaker Foundation at Braehead Arena before taking to the stage. The sick kids included Ashlee Easton, 10, from Falkirk who has neuroblastoma and Nathan Mowat, six from Greenock who has Acute Lymphoblastic Lymphoma and Isla Aitken who has just finished treatment for leukaemia. As well as giving them goody bags with caps and badges in them, the celebs spent some time chatting with the kids. Emily said: "Its such an amazing surprise from the Dreammaker Foundation and we've got a handshake going on. It's so nice to see Sparky and everyone. We're having a lovely time on tour." 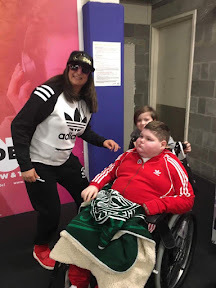 Afterwards Sparky's mum Michelle Gallagher said: "Sparky was absolutely thrilled to meet his hero Honey G. His wee brother came too. He has a brain tumour and was recently in hospital for pancreatitis surgery. Things like this just keep him going." Ashlee's mum Isla added: "Ashlee has just had a relapse and we find it hard to plan things so it was lovely when Les and Angela from the Dreammaker Foundation got us tickets for this. Ashlee absolutely loved it and is hyper. 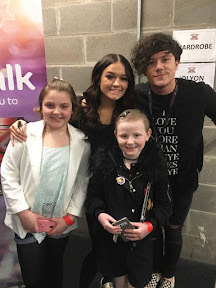 She loves the X factor and music and singing and dancing and Emily Middlemas remember her from when she recorded a Christmas single with others for the charity." Nathan's mum Jill added: "It was a wee escape from treatment and a real treat. It's great to have some normality and something positive in negative situations and Nathan just loved it. Les and the foundation do amazing work."